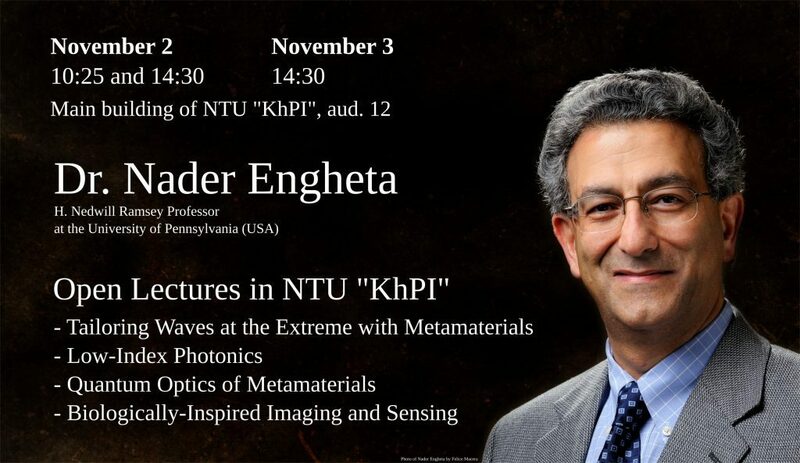 American Professor Dr. Nader Engheta Willing to Give Lectures at KhPI – National Technical University "Kharkiv Polytechnic Institute"
On November 2 -3, 2017 Dr. Nader Engheta from the University of Pennsylvania is going to pay a visit to the National Technical University “Kharkiv Polytechnic Institute” to give the cycle of lectures within the framework of Program called “Meeting Successful People”. Dr. Nader Engheta is currently H. Nedwill Ramsey Professor of Electric and Systems Engineering at the University of Pennsylvania (Florida, USA). Dr. Nader Engheta developed an active research program for different scientific topics in the field of optics and microwaves starting from metamaterials and nanophotonics through the optic visualization of one-atom optic devices and nanometer circuits. In 2006 Prof. Nader Engheta joined top-50 leaders in the field of science and technology according to the Scientific American Journal version. the Prize for outstanding achievements in the field of broadcasting, IEEE in 2015. He was granted the Guggenheim scholarship in the field of natural sciences given to the students in the USA and Canada and other awards. At the end of September 2017 Professor Nader Engheta was given the rank of Doctor Honoris Causa of NTU “KhPI” by the unanimous decision of the Academic Council of NTU “KhPI” (the minutes No7of 21.09.2017).